This might be a bad idea, but I read the first fifty pages and found them very captivating. I occasionally feel nostalgic for Dickens, though I’ve definitely read better and worse books by him. I really enjoyed Great Expectations, Bleak House, and David Copperfield; sort of enjoyed (but was also intermittently bored by) Little Dorrit, Nicholas Nickleby, and Hard Times; and absolutely disliked Oliver Twist. Dickens is a weird one. There’s no other writer quite like him. On a sentence- and scene-level, there’s no writer who trusts his readers quite so much. Dickens doesn’t explain everything. He expects you to just get it. If a character is saying nonsense, he doesn’t say, “This character is saying nonsense,” he just expects you to see the nonsense. And his characters are incredibly memorable, of course. The problem is that he veers suddenly into absolute tedium and then you’re just down there, wallowing in it, until he hits his stride and decides to be interesting again. Even David Copperfield, which is almost perfect, has a pretty dull patch right around when he gets married. And in a Dickens-length novel, a dull patch can easily be a hundred pages. It’s pretty tortuous. So yes, I am afraid. Our Mutual Friend is over 1000 pages long and it could, literally, at any moment turn awful. 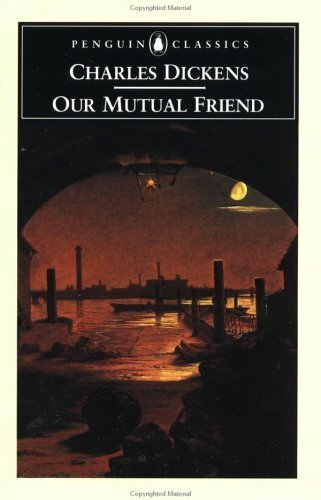 OUR MUTUAL FRIEND IS MY FAVORITE DICKENS. I mean last time I read it was ten years ago so this may no longer be true or accurate, but at the time I found it delightful. Perfect combination of angrily competent little girl and Dickens being really hilariously awkward and semi-apologetic about his past anti-Semitism. …I mean I guess there is also a plot, but that’s what has stuck with me. I am enjoying it so far. 1/5th of the way in and so far there’s been extremely few tedious parts. Haven’t gotten to the Jewish part yet, though.